Before this version, Jules Verne's story had already been filmed twice in the silent era; in addition to this American adaptation, it was filmed four more times in Europe. Anton Walbrook here makes his Hollywood debut as a dashing emissary of the Tsar who is sent from St Petersburg to the frozen wastes of Siberia. The journey involves clashes with Tartars, romantic interludes and an interview with a British journalist. Despite some decent scenes and some lavish detail, what the movie really needs is a director like Michael Curtiz to bring it to life. Adventure starring Anton Walbrook. 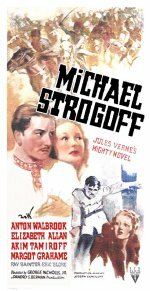 Russia during the Tartar rebellion of 1879: courier Michael Strogoff is sent by the Tsar to take vital information to the Russian army in Siberia. But the courier is captured and sentenced to be blinded. A daring escape plan is then put into action.